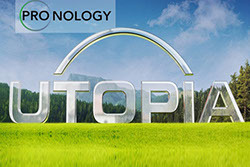 Fox’s Utopia, produced by Talpa Media, USA, was one of the most ambitious reality programs produced to date. Its unprecedented production size and tight broadcast schedule required a multitude of impressive engineering feats. Pronology’s custom media management system is perfectly suited to address the challenges of handling a huge amount of content generated by a production of this size. Fox’s social experiment recorded non-stop – 24 hours a day, seven days a week – using 130 robotic cameras. The raw camera feeds were sub-switched into 12 recorders under the direction of the story producers in what could be considered the first phase of the “editing” process. These 12 media streams were recorded using custom-built Pronology ProStream encoders. Each ProStream seamlessly records three tiers of video, including high resolution (XDCam 50) media files, a lower resolution “edit proxy” (Avid JFIF 15:1, also wrapped as MXF OP Atom) and a live web-streamable proxy of multiple bit-rates. Pronology includes a custom ingest control application that was used on Utopia to record, manage, distribute and archive media. Since Pronology is completely agnostic to hardware, it offers the record operators a single interface to control and oversee the multiple pieces of equipment that were involved. As the system administrator, I ensured that each tier of video was recorded safely to one of the three large Avid ISIS systems we had onsite. As soon as each recording was completed, it was immediately archived onto an LTFS compliant, LTO data tape. We wrote a total of 462,000 files, or 32 Terabytes of media, in each 24 hour period. One of the biggest production challenges here at Utopia was a fast turnaround schedule. Because Pronology eliminates the need for any transcoding, assistant editors started working with media as soon as each set of hourly files was closed out, and editors could begin cutting immediately. Alongside the technical solutions it provides, Pronology was also a storytelling device used by producers – from the control room through post-production. Pronology’s online web interface allowed producers, working both on and offsite, to view all recorded content. Because this system is web-based, producers are free to work anywhere they have an Internet connection. Pronology’s logging tool enabled onsite loggers to create timecode accurate tags and notes, live, 24 hours a day. Pronology has amassed 2.7 million unique metadata entries for the program, all of which are completely searchable. This enabled producers to sift through the show’s massive amount of media and find the best moments to include in the broadcast. As a department head, Pronology’s cohesive and powerful system, coupled with their 24-hour support, allowed me to oversee Utopia’s media management with a team of only four people. Piecing together products from multiple vendors would typically require a much bigger team of operators, which would much more prone to error. In the end, working with Pronology helped me deliver healthy media in an efficient, timely manner from production through post and to archive.